A friend of mine calls deviled eggs bedeviled eggs. Actually, I’m not even sure he knew they were really called deviled eggs. The name stuck with me because why have just deviled eggs when you can have bedeviled eggs? I love these eggs however they’re made. There’s just something wonderfully decadent about them. I’ve had fancy ones and simple ones. This is the simple version. 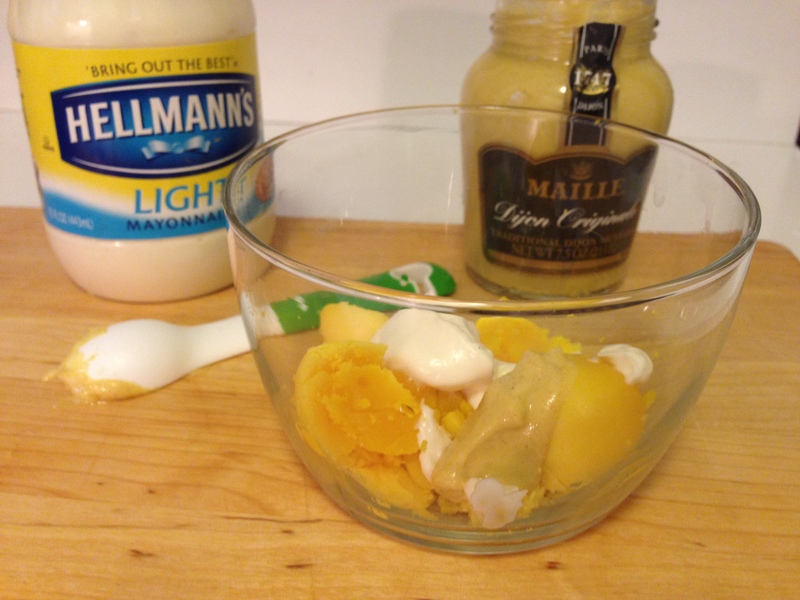 It’s the bare bones: mayonnaise and mustard. But it always satisfies my cravings and hopefully it’ll do the same for you! The secret to making great deviled egg starts with knowing how to properly hard-boil an egg. 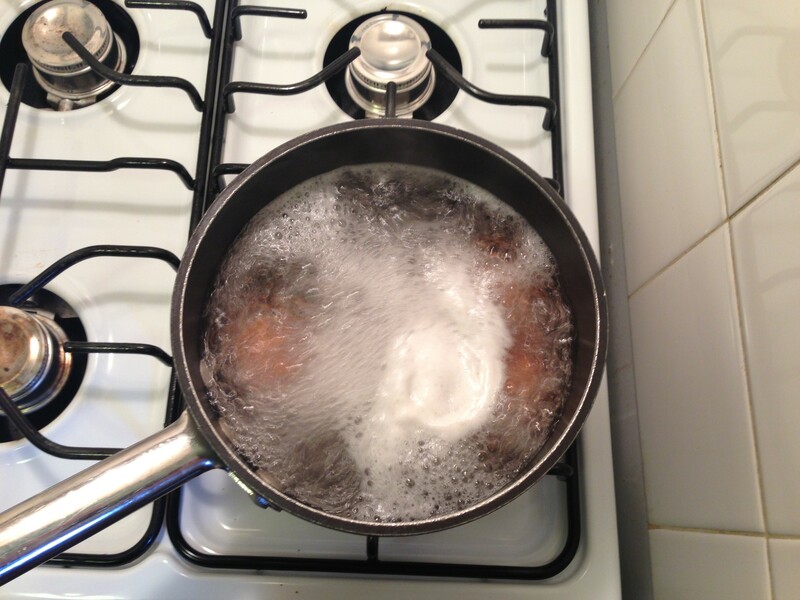 Place the eggs in cold water in a saucepan on the stove. Bring the water to a boil. 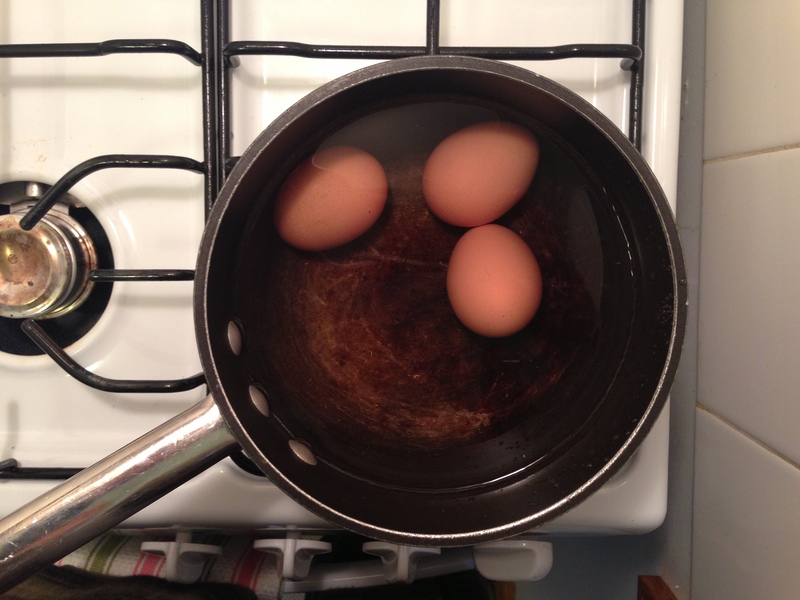 Once the water is boiling, turn off the heat, cover the pot and let the eggs sit in the hot water for about 12 minutes. Remove the eggs from the water and let them sit until they cool completely. If they are NOT cool, their shells will not peel easily — the shell will stick to the egg. When they are completely cool, I drop them onto a flat surface and roll them around to gently break the shells. 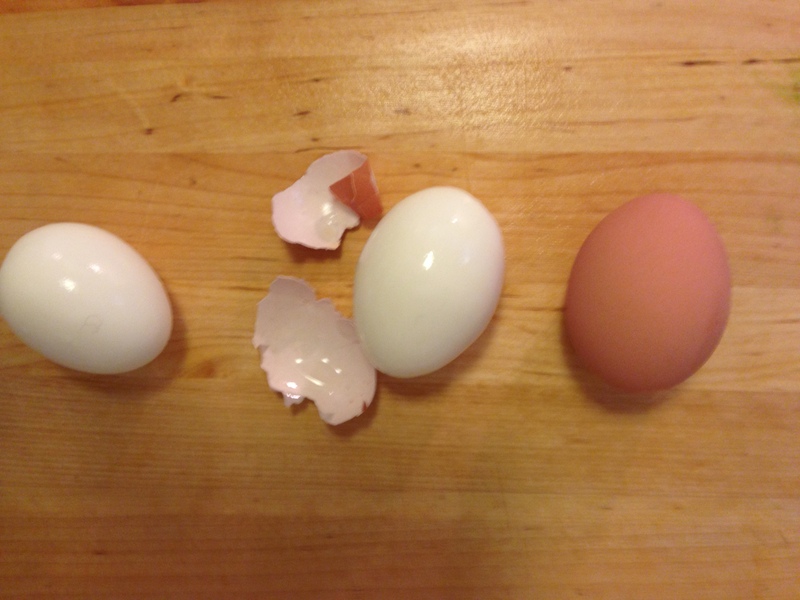 Just a note here that some egg shells are easier to take off than others (some eggs simply stick to their shells). To make it even easier to remove the shells, dunk the eggs in ice water for a few minutes to expedite the cooling process. Now gently slice the deviled eggs in half. Gorgeous color, huh? Well done. Now it’s time to make the filling. 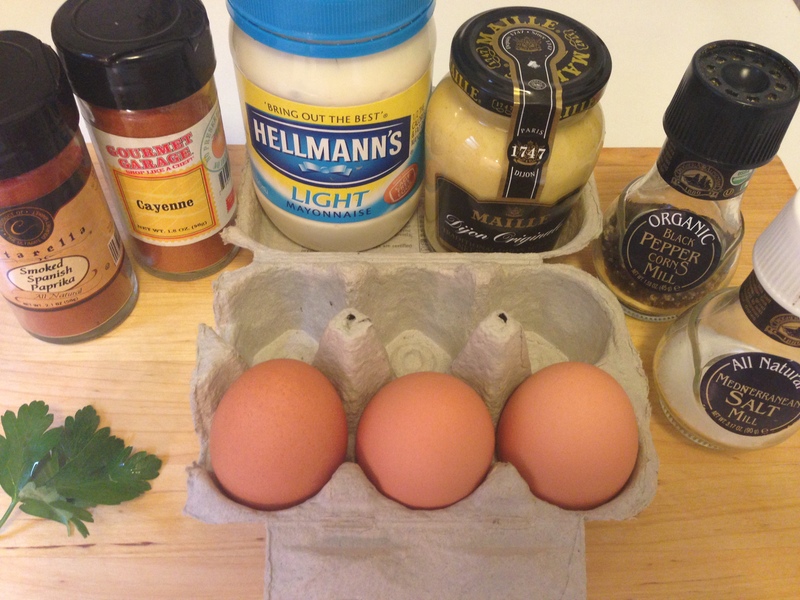 Combine your mayonnaise and mustard with the yolks, season with salt and pepper, and mash with a fork. This filling is such a blank canvas — consider it the most basic deviled eggs recipe. To make a deviled egg recipe with a bit more flair, add chopped spicy pickles or some Sriracha for added heat. Now fill each deviled egg white half with about a teaspoon of filling. Sprinkle with paprika and a dash of cayenne pepper for heat. Garnish with parsley. I’ll typically refrigerate the filling or the filled deviled eggs before I eat them just because I like to enjoy them cold. THE EGG YOLKS ARE NOT DONE!!!! !